GBU-43/B Massive Ordnance Air Blast weapon, or so-called "Mother of All Bombs," on a remote part of Afghanistan, American officials have released little information about the strike or its aftermath, and security forces in the area continue to block access the site. In a move reminiscent of Vietnam-era body-count assessments, Afghan officials have released estimates of the number of ISIS fighters killed in the MOAB strike, upping the total from 36 to 96 over the last six days. Reports from the region indicate that a number of the ISIS fighters slain were drawn from neighbouring countries. An Afghan security source told the country's TOLO news agency that most of the militants killed in the bombing were members of Tehrik-e Taliban Pakistan (TTP) or of Pakistan-based Lashkar-e-Taiba. And alongside the dozens of Pakistanis thought to have been killed in the strike, 12 Tajikistanis and 13 Indian nationals who had joined ISIS were killed, according to TOLO news. The United States dropped the most powerful nonnuclear bomb in its arsenal on what it said was an ISIS cave complex in remote Afghanistan. The bomb — called the GBU-43/B Massive Ordnance Air Blast — can obliterate everything within a 1,000-yard radius. WASHINGTON — The United States dropped the “mother of all bombs” — the most powerful conventional bomb in the American arsenal — on an Islamic State cave complex in Afghanistan on Thursday, the Pentagon said, unleashing a weapon so massive that it had to be dropped from the rear of a cargo plane. The strike was the first combat use of what is formally named the GBU-43/B Massive Ordnance Air Blast. President Trump has bestowed additional authority on the Pentagon in his first months in office, which the military has argued will help it defeat the Islamic State more speedily. Mr. Trump did not say whether he had personally approved Thursday’s mission. The Syria strike — on Tuesday near the town of Tabqah, which Syrian fighters and American advisers are trying to capture — was the third American-led airstrike in a month that may have killed civilians or allies. Earlier bombing runs killed or wounded scores of civilians in a mosque complex in Syria and in a building in the west of Mosul, Iraq. American commanders in Iraq and Syria have been given more authority to call in strikes, a loosening of the reins that began in the last month of the Obama administration. But some national security experts said that Mr. Trump and the Pentagon risked inflaming anti-American sentiment in the Muslim world with their approach to fighting the Islamic State. The number of civilian casualties reported in American-led strikes in Iraq and Syria has increased since Mr. Trump took office, and March was the deadliest month for civilians ever recorded by Airwars, a group that tracks bombings. Reports of civilian casualties in Iraq and Syria jumped to 3,471 from 1,782 the month before, the group said. In the wake of a series of terrorist attacks, including the Feb. 16 bombing of a Sufi shrine that killed more than 80 people, the Pakistani army has launched Operation Radd-ul-Fasaad, its 11th counterterrorism campaign since 2007. Unlike its predecessors, Radd-ul-Fasaad puts a focus on the densely populated Punjab province, Pakistan's political and industrial heartland. So far, the campaign, launched by army Chief of Staff Gen. Qamar Javed Bajwa, has focused on coordinated raids conducted by the paramilitary Punjab Rangers and civilian law enforcement. The raids have led to at least 1,300 arrests and the seizure of caches of ammunition, weapons, computers and improvised explosive devices. But though the operations seem to have minimally disrupted civilian life, Pashtuns living in Punjab have complained that they have been unfairly singled out. Punjab Law Minister Rana Sanaullah acknowledged that the raids have focused on Pashtuns and unregistered Afghan refugees in Punjab since attacks in the state have been traced to militants operating out of the Pashtun-majority Federally Administered Tribal Areas (FATA) bordering Afghanistan. In addition to raising ethnic groups' concerns, the new military operation will likely exacerbate another emerging trend in Pakistan's militant landscape: high-profile attacks by the Islamic State's Afghanistan-based Khorasan chapter working with local groups, including an offshoot of the Pakistani Taliban. Khorasan has designs on expanding into South Asia, and since August, the group has claimed at least three big attacks in Pakistan — one in Balochistan, one in Sindh and one in Punjab. The challenge for the Pakistani army, then, is to prosecute counterterrorism operations while minimizing militant blowback. Yet because April marks the traditional start of the annual spring offensive, this development — coupled with the desire to retaliate against the army for Radd-ul-Fasaad — means it's likely that Pakistan (as well as Afghanistan) will experience more Khorasan-linked attacks in the next few months. Radd-ul-Fasaad fits into the Pakistani army's broad counterterrorism campaign. Ever since it launched Zarb-e-Azb in June 2014, the number of attacks by militants fell by 27 percent in 2016 as compared with 2015. By layering Radd-ul-Fasaad upon the still-ongoing Zarb-e-Azb, the carnage is likely to continue decreasing (though to be sure, this comes at the cost of having fewer troops to devote toward countering India, which is why Bajwa will try to avoid antagonizing New Delhi as long as the operations are underway). Still, the army and the government both recognize that an approach based solely on military intervention is unlikely to end the threat of anti-state militancy. Until Islamabad accrues the political capital to pursue other reforms, militancy will endure. Afghan officials have reported a big rise in the death toll from America’s biggest non-nuclear bomb, nicknamed the ‘mother of all bombs’, announcing that the mega-bomb killed over 90 Islamic State fighters. The GBU-43/B Massive Ordnance Air Blast Bomb (MOAB) was unleashed in combat for the first time on Thursday. The 21,000-pound (9,525 kg) bomb was dropped on a tunnel complex in the Achin district of the Nangarhar province in eastern Afghanistan near the Pakistani border. The area is said to be used by affiliates of Islamic State (IS, formerly ISIS/ISIL). The MOAB, developed during the Iraq war, was never used after testing due to concerns that it could cause mass civilian casualties. According to Ataullah Khogyani, spokesman for the governor of Nangarhar province, 94 militants were killed in the blast, including four commanders. "Fortunately there is no report of civilians being killed in the attack," Khogyani told AP. Earlier, Achin district’s governor Esmail Shinwari said 92 IS fighters had been killed. These death tolls are much higher than the initial figure of 36 IS fighters provided by Afghan officials. 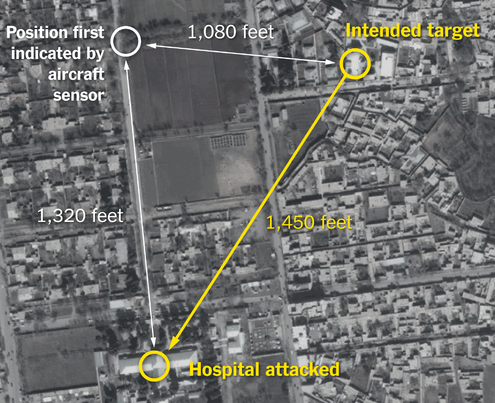 Although the US Central Command noted that they “took every precaution to avoid civilian casualties with this strike,” the weapon’s documented force and the remote location of the blast has led some to question to what degree of accuracy the death toll could be tallied. Not a fortnight back India’s National Security Adviser Ajit Doval betook himself to Washington and there in his meeting with his US counterpart he squawked and he complained against, what else, Pakistani-sponsored terrorism in India. Yesterday, Lt Gen HR McMaster, Trump’s NSA made an unannounced trip to Islamabad. So it was the case in the one instance of Muhammad going to the Mountain and, in the other, of the Mountain coming to Muhammad! Had this statement been confined to the first part of it, namely, “that the Pakistani leaders will understand that it is in their interest to go after these groups less selectively than they have in the past”, then Narendra Modi’s BJP regime, which seems to have made leaning on the US its foreign and security policy calling card, could have taken heart. After all McMaster would have been seen as buying into Delhi’s argument about Pakistan’s complicity. Instead, as the US NSA and his team made clear, Washington is desperately keen that the Pakistan Army not roil the Afghan scene by silk-gloving the terrorist Haqqani Network elements who enjoy safe haven on the Pak side of the Durand Line, and by implication, that it doesn’t give a damn whether GHQ, Rawalpindi, reins in terrorist gangs such as the Lashkar-e-Tayyaba and Jaish-e-Mohammad active in J&K, or not. McMaster’s lightning visit also suggests that the Trump Administration understands well that the use of massive fuel air explosives to decimate Daesh (Islamic State) concentrations, will not do the trick. And hence that the frontline role of Pakistan is critical to a defeated US doing the obvious thing — declaring victory and getting the hell out! NO, the US is NOT in South Asia to support and advance India’s national interest. NO, NO, the US is NOT in the least keen about stamping out terrorism at-large, leave alone terrorists discomfiting India, only terrorists directly threatening the US and its interests. NO, NO,NO you can’t cut a mutually beneficial deal with President Donald J Trump — as the Indian PM expects to when he visits the US this year, unless the benefit tilts overly to the American side. And NO, NO, NO, NO, umrika bahadur will NOT save India’s goose in any circumstances, and CANNOT be relied on to do anything other than work to bolster its own national interest at all times. And, YES, India will have to further its own interests by itself, by whatever means and whatever it takes. When the diplomatic geography is so little appreciated and basic precepts of international relations are ill-understood by the Indian leadership and, institutionally, by the Government of India, it is hardly to be wondered that India gets it in the neck all the time. For over two years, Islamic State controlled the Iraqi city of Mosul, including its schools. Now that the U.S.-led coalition has pushed the Islamists out, the city’s teachers face a dilemma: How do you reshape the minds of children who were taught to fight and kill? On a morning in late March, 20 children are standing between bombed houses and burned-out cars in front of an elementary school on a street in eastern Mosul. When you ask them what they learned inside, they talk about killing. Their teacher was Islamic State (IS), which had a stronghold here. “Daesh, Daesh,” the children shout, using the Arabic pejorative for IS, with strong, excited voices, as if the sound concealed an unbelievable secret. The children are between the ages of 6 and 13. Their backpacks are too large for their bodies, they wear sandals and their T-shirts have holes. Some ate eggs that morning, others didn’t. As the children wait for the gate to open, they call out and laugh. Their happiness is real, but if you look through it, you can see the war in their small, hardened faces. IS conquered Mosul in June 2014. When it tried to create a state, it didn’t stop at acquiring land, people, a doctrine and a flag. It also pushed into every crevice of social life — it controlled the economy, administered justice and created lesson plans that fit its views. The goal of IS was to create a worldview, which also led it to take over Mosul’s schools. 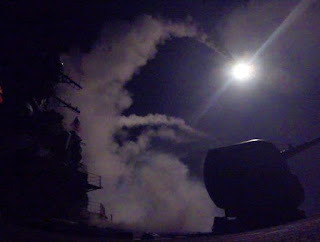 ** The United States, Syria and Russia A strategy toward the Middle East requires more than short-term tactical moves. Last week’s American attack on a Syrian air base raises three important questions. First, what is the U.S. strategy in the Middle East? Second, what is the U.S. strategy toward Russia? Finally, what is the Russian strategy in general? The three strategies intersect, but at this moment none of them are apparent. Therefore, it is useful to try to understand each of them individually and then consider how they all fit together. Let me begin with an obvious political point. Candidates for president say one thing during their campaigns and then behave differently when elected. We have seen this play out many times. Thomas Jefferson entered into a deal to buy the Louisiana Territory before getting congressional authorization, thereby supporting the dictator Napoleon, and Franklin D. Roosevelt promised to stay out of war during the 1940 election while secretly making plans to enter the war. U.S. presidents have a long tradition of not keeping their election pledges. Part of it is cynicism, part of it is that the reality of being president compels shifts in behavior. Only those wanting to be shocked will be shocked that President Donald Trump’s actions differ from his campaign promises. India pledged to never use its nuclear weapons first. An excerpt from Shivshankar Menon’s Choices: The making of Indian Foreign Policy tells us why. After publicly testing her nuclear weapons for the first time at Pokhran, India under the National Democratic Alliance (NDA) government swore by the no-first-use doctrine. For these weapons of destruction beyond human imagination were not just that. They were political armament that could redefine power equations among the nuclear weapon states (NWS) in the nuclear age. Though India declared that these were the nation’s defence against nuclear threat and blackmail, it was also made clear that if anyone dared use any such weapons against us, retaliation was assured, an unapologetic one at that. Author and diplomat Shivshankar Menon’s decades of experience in various critical positions that include being the national security adviser to former prime minister Manmohan Singh, and the Indian High Commissioner to Pakistan, and Sri Lanka and the ambassador to China and Israel, in his book Choices: The making of Indian Foreign Policy, sheds light on the nitty gritty of the reasons behind five crucial decisions that the nation has made, one of which is the thought behind India’s No First Use nuclear policy. There has been debate in India over whether the country’s no-first-use commitment adds to or detracts from deterrence. Successive Indian governments that have reviewed the question repeatedly since 1998 have been of the view that a no-first-use policy enhances India’s deterrence efforts. ** Why are politicians uncomfortable with military men? 'Why can't one who has overseen national security planning become our NSA or chair the National Security Advisory Board?' asks Vice Admiral Premvir Das (retd). Much has been said and written about the government's decision to appoint a new army chief, overlooking two others senior to him. The media, Opposition parties and even retired generals made it their business to air their views on a decision that lay fully within the preserve of the government of the day. General Bipin Rawat is now in the chair and the other two generals have willingly decided to serve their full tenures under him. Full marks to them for their approach; in earlier cases those superseded had resigned, which also has logic. Things having now returned to normalcy, it is time to look at some of the larger questions. First, one selects people to occupy such high positions, implying that there must be four or five qualified and eligible persons to choose from. Second, just because all of them are necessarily good does not mean that the most senior of them must be the automatic choice; the whole concept of selection then falls through. So, some set of criteria have to be evolved and it is the business of those running the country to decide these. This may be a bitter lesson for both the Tatas and Adanis, but India Inc needs to learn deep lessons on managing such risks as they seek to become global players. The Supreme Court’s decision to junk a ruling by the Appellate Tribunal for Electricity (Aptel), that Adani Power and Tata Power can charge higher tariffs due to an increase in the cost of coal imported from Indonesia, is correct in law. Aptel had granted relief to these two port-based power units, which were to run on cheap imported coal, after the Indonesian government suddenly changed rules in 2010 to levy a duty on exports. Aptel said this was a force majeure event, meaning this could not have been anticipated when the two companies made tariff-based bids for their power plants in coastal Gujarat. But the Supreme Court bench, with Justices P C Ghose and Rohinton Nariman, ruled that only domestic policy changes could be called force majeure events, not foreign ones. Hence the tariff increases will have to be rolled back, damaging their bottomlines. Mint estimates the impact on Tata Power at Rs 800-1,000 crore annually, which may prompt the company to seek an exit from the project, which will become a new headache for the lenders. The Trump administration's Afghanistan strategy should take into account that the international situation is more dangerous than ever. Good strategies are essential for the priority national-security challenges America faces, whether it is Syria, ISIS, Russia, China, North Korea or Afghanistan. President Trump has sent National Security Advisor H. R. McMaster to Afghanistan as part of a U.S. strategy in that key country. Afghanistan is America’s longest-standing commitment in the post-9/11 struggle against terrorism and remains a frontline state in that effort. In February, the commanding U.S. general in Afghanistan testified that some twenty terrorist groups are operating in the Afghanistan-Pakistan region, the “highest concentration” in the world. Despite massive investments by the United States and its allies, Afghanistan still faces a vigorous Taliban insurgency with safe havens in neighboring Pakistan, as well as serious governance and development challenges. The Trump administration is wisely taking a careful look at the U.S. approach, including the request by the U.S. commander to add troops. The proposals that emerge from the review merit close attention, given the human and financial treasure that America has invested and the national interest in ensuring that Afghanistan is not again a sanctuary for transnational extremists, as it was when Al Qaeda planned the 9/11 attacks there. The policy review will draw lessons from the United States’ fifteen year involvement. National Security Advisor McMaster, among others, served as part of the U.S. surge in Afghanistan. In particular, he worked to counter corruption in the country. China’s recent vocal assertions and activities over its maritime disputes have harmed its relations with neighbors and others, including the United States. Nevertheless, the July 2016 Hague ruling may have provided a window of opportunity to de-escalate tension as well as a possible way out for all parties. The U.S. power grid has long been considered a logical target for a major cyberattack. Besides the intrinsic importance of the power grid to a functioning U.S. society, all sixteen sectors of the U.S. economy deemed to make up the nation’s critical infrastructure rely on electricity. Disabling or otherwise interfering with the power grid in a significant way could thus seriously harm the United States. Carrying out a cyberattack that successfully disrupts grid operations would be extremely difficult but not impossible. Such an attack would require months of planning, significant resources, and a team with a broad range of expertise. Although cyberattacks by terrorist and criminal organizations cannot be ruled out, the capabilities necessary to mount a major operation against the U.S. power grid make potential state adversaries the principal threat. Attacks on power grids are no longer a theoretical concern. In 2015, an attacker took down parts of a power grid in Ukraine. Although attribution was not definitive, geopolitical circumstances and forensic evidence suggest Russian involvement. A year later, Russian hackers targeted a transmission level substation, blacking out part of Kiev. In 2014, Admiral Michael Rogers, director of the National Security Agency, testified before the U.S. Congress that China and a few other countries likely had the capability to shut down the U.S. power grid. Iran, as an emergent cyber actor, could acquire such capability. Rapid digitization combined with low levels of investment in cybersecurity and a weak regulatory regime suggest that the U.S. power system is as vulnerable—if not more vulnerable—to a cyberattack as systems in other parts of the world. If you haven't seen that video yet, the stare she gives the Russian ambassador makes it must see viewing. I was impressed. When President Obama gave Syria a red line on chemical weapons back in 2013, and Assad crossed that red line, you may remember I was quite uncomfortable with how everything had gone down. I was uncomfortable with the President giving the red line, and I was uncomfortable with the idea the US would have to attack Syria. President Obama took a lot of criticism for addressing that incident in 2013 with diplomacy, but the United States ultimately removed a considerable amount of chemical weapons from Syria via MV Cape Ray and over time I came to appreciate the decision by President Obama. Until this past week, there had been no clear evidence of chemical weapons use by the Assad regime in Syria against civilians, including for the entire remainder of the Obama administration. In my mind, what President Obama did at the time was the right thing. But when news broke about chemical weapons use in Syria this week, particularly in the context of what is happening on the Korean peninsula, in my mind President Trump had a very serious choice to make. He either attacked Syria for breaking their agreement with President Obama, or the United States retreated from the role as the leader of the global security construct the world has enjoyed since the end of the cold war. President John F. Kennedy steered the United States through the most dangerous moments of the Cold War during the Berlin and Cuban Missile Crises. Afterwards, he made a special appeal to Congress, arguing, “For the nation, increasing the quality and availability of education is vital to both our national security and our domestic well being.” Kennedy insisted that the cultivation of the American intellect through federal funding for education must be a security priority in an increasingly dangerous world. Kennedy’s wisdom appears to be lost on President Donald Trump. The new president offers policy proposals that suggest he fails to see how education and intellectual capital contribute to the safety of the United States. Trump has unapologetically proposed an immigration ban targeted at Muslim countries and a $54 billion increase in defense spending that purportedly “advances the safety and security of the American people.” However, these policies come at the cost of cutting funds to federal agencies — such as the State Department (28.7 percent) and the Department of Education (13.5 percent) — that support critical education and research programs. As such, these proposed policies will jeopardize U.S. security by neglecting the educational and intellectual growth necessary to sustain American power. Historically, the federal government nurtured the American intellect through investment in education at all levels, funding cultural and humanities programs and embracing foreign intellectual talent. These initiatives have reinforced American security by contributing to diplomacy and strategic thinking, the development of military technologies and tactics, and the pace of economic innovation. Given this context, cutting important education funds and limiting immigration undermines the intellectual development imperative to U.S. power and influence. Foreign aid can help advance U.S. national interests, for example, by promoting our values globally or by demonstrating to the world the goodwill of the American people. Calls to eliminate funding outright often fail to weigh this important function. But our lead aid agency has itself been jeopardizing this effort, and risking all-important public support, by irresponsibly funding leftist agitprop around the world—and enlisting the help of billionaire progressive activist George Soros in the process. Trying to persuade Colombians, Macedonians, Kenyans, and the Irish to accept violations of traditional norms that are still being debated here was surely not what Congress had in mind when it passed the Foreign Assistance Act of 1961 and thereby created the U.S. Agency for International Development, or USAID. The Air Force is looking for defensive cyber operations contractor support to protect space weapon systems. In a request for information issued at the end of March, the 50 th Network Operations Group, which falls under the 50th Space Wing, is soliciting industry cyber defense capabilities to enable protection, detection, response and sustainment of 50th Space Wing cyber defense missions. While the Air Force has its own organic cyber force, this cadre is focused solely on the Air Force portion of the DoD’s information network. Given that AFCYBER serves as the Air Force or service cyber component to Cyber Command, it has a responsibility to ensure the defense of all Air Force information networks to include, but not limited to Air Force NIPR and SIPRNet, a spokesman from Air Force Space Command told C4ISRNET via email. Spying tools and operational protocols detailed in the recent Vault 7 leak have been used in cyberattacks against at least 40 targets in 16 different countries by a group Symantec calls Longhorn. Symantec has been protecting its customers from Longhorn’s tools for the past three years and has continued to track the group in order to learn more about its tools, tactics, and procedures. The tools used by Longhorn closely follow development timelines and technical specifications laid out in documents disclosed by WikiLeaks. The Longhorn group shares some of the same cryptographic protocols specified in the Vault 7 documents, in addition to following leaked guidelines on tactics to avoid detection. Given the close similarities between the tools and techniques, there can be little doubt that Longhorn's activities and the Vault 7 documents are the work of the same group. Longhorn has been active since at least 2011. It has used a range of back door Trojans in addition to zero-day vulnerabilities to compromise its targets. Longhorn has infiltrated governments and internationally operating organizations, in addition to targets in the financial, telecoms, energy, aerospace, information technology, education, and natural resources sectors. All of the organizations targeted would be of interest to a nation-state attacker. Longhorn has infected 40 targets in at least 16 countries across the Middle East, Europe, Asia, and Africa. On one occasion a computer in the United States was compromised but, following infection, an uninstaller was launched within hours, which may indicate this victim was infected unintentionally. On 5 April a new organisational structure was formed as part of the Bundeswehr: the Cyber and Information Space (Cyber-und Informationsraum, CIR). It holds the same rank as the Joint Support Service and the Joint Medical Service, which function in parallel with the three branches of the armed forces (the Army, the Air Force and the Navy). The CIR will group together all the Bundeswehr structures dealing with IT, cyber-security, military reconnaissance and geo-information, as well as with psychological warfare. The CIR is designed to strengthen the protection of the Bundeswehr’s computer networks and weapon systems, but also to develop capabilities for offensive actions in cyberspace. The newly-created CIR Command will supervise the Strategic Reconnaissance Command, the IT Command and the Geoinformation Centre, as well as their subordinated units, which had all previously been part of the Joint Support Service. After the integration of all the above-mentioned units this year, the CIR should include around 14,000 civilian and military staff; there are plans for further expansion. The CIR’s Inspector is Gen. Ludwig Leinhos, who from 2013 to 2016 was Director of the NHQC3S (NATO Headquarters Consultation, Command and Control Staff) at NATO Headquarters in Brussels. The German Ministry of Defense also underwent a transformation related to the new emphasis on the areas of cyber security and IT. Since October 2016 the structures of the ministry have included a CIT (Cyber/IT) Department, which deals with the planning and implementation of the national cyber-security strategy in the defense sector, and is responsible for the cyber-security of the Bundeswehr’s computer systems. Microsoft Corp (MSFT.O) said on Thursday it had received at least a thousand surveillance requests from the U.S. government that sought user content for foreign intelligence purposes during the first half of 2016. WASHINGTON - A decade ago, he was a young Army soldier training Iraqi troops when he noticed their primitive filing system: handwritten notes threaded with different colors of yarn, stacked in piles. For organization's sake, he built them a simple computer database. Now an Army reservist, the major is taking a break from his civilian high-tech job to help America's technological fight against Islamic State group. He's part of a growing force of experts the Pentagon has assembled to defeat the extremists. "The ability to participate in some way in a real mission, that is actually something that's rare, that you can't find in private sector," said the 38-year-old Nebraska native who is working at U.S. Cyber Command at Fort Meade, Md. "You're part of a larger team putting your skills to use, not just optimizing clicks for a digital ad, but optimizing the ability to counter ISIS or contribute to the security of our nation." The consensus report of the United Nations Group of Governmental Experts (UN GGE) on Developments in the Field of Information and Telecommunications in the Context of International Security, adopted in July 2015, shows progress: it proposes norms of responsible behaviour and includes comments on how international law applies. The next UN GGE is likely to be formed as soon as 2016. The UN General Assembly convened the group after the third UN GGE had completed its work in 2013 (see INCYDER news brief). The new report is regarded as representative of global views on state use of cyber capabilities, as the group comprises 20 countries,1 based on ‘equitable geographical distribution’ and including key ‘cyber powers’ such as the US, China, Russia, France, the UK and Germany. The most highlighted aspect of the previous UN GGE’s report (2013) was its affirmation that international law applies in cyberspace. Despite some speculations that the 2014-15 group might be unable to uphold this view, it has succeeded in further specifying the normative framework for state use of cyber capabilities. FOR EIGHT MONTHS, the hacker group known as Shadow Brokers has trickled out an intermittent drip of highly classified NSA data. Now, just when it seemed like that trove of secrets might be exhausted, the group has spilled a new batch. The latest dump appears to show that the NSA has penetrated deep into the finance infrastructure of the Middle East—a revelation that could create new scandals for the world’s most well-resourced spy agency. Friday morning, the Shadow Brokers published documents that—if legitimate—show just how thoroughly US intelligence has compromised elements of the global banking system. The new leak includes evidence that the NSA hacked into EastNets, a Dubai-based firm that oversees payments in the global SWIFT transaction system for dozens of client banks and other firms, particularly in the Middle East. The leak includes detailed lists of hacked or potentially targeted computers, including those belonging to firms in Qatar, Dubai, Abu Dhabi, Syria, Yemen, and the Palestinian territories. Also included in the data dump, as in previous Shadow Brokers releases, are a load of fresh hacking tools, this time targeting a slew of Windows versions. WASHINGTON (AP) — A decade ago, he was a young Army soldier training Iraqi troops when he noticed their primitive filing system: handwritten notes threaded with different colors of yarn, stacked in piles. For organization's sake, he built them a simple computer database. "The ability to participate in some way in a real mission, that is actually something that's rare, that you can't find in private sector," said the 38-year-old Nebraska native who is working at U.S. Cyber Command at Fort Meade, Maryland. "You're part of a larger team putting your skills to use, not just optimizing clicks for a digital ad, but optimizing the ability to counter ISIS or contribute to the security of our nation." Last year, then-Defense Secretary Ash Carter expressed frustration that the United States was losing the cyberwar against the militants. He pushed the Cyber Command to be more aggressive. In response, the Pentagon undertook an effort to incorporate cyber technology into its daily military fight, including new ways to disrupt the enemy's communications, recruiting, fundraising and propaganda.